We offer knobs for the Meade 14” f/10 (Item A) and f/8 (Item B) Schmidt-Cassegrain secondary with exposed collimation screws. These telescopes have six secondary screws. The three inner screws are for collimation. The three outer screws are for secondary disassembly, not collimation. We do not offer knobs for the very early Meade 14” f/10 Schmidt-Cassegrain telescope with recessed factory collimation screws (Item C). These knobs are for the f/10 version only. See Item B (below) for f/8 knobs. 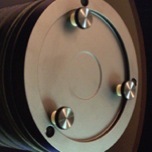 See our FAQ and technical paper for additional information on installing Bob's Knobs on Meade telescopes with six factory secondary screws. These knobs are for the f/8 version only. See Item A (above) for f/10 knobs. 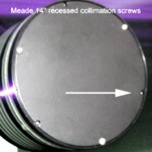 Early Meade 14” f/10 SCTs have recessed collimation screws, as shown in the photograph. These headless set screws are located near the perimeter of the secondary and are accessed through notches in the cover plate. We do not offer knobs for these scopes because they would be in the light path.